Many models of Geiger Counters in our selection can be used with our optional GeigerGraph software for a Windows PC. Each pulse or count from the Geiger Counter is transmitted through a data cable, and via the software, displays and graphs those counts per minute in terms of the Current reading, an Average, and Minimum and Maximum counts per minute (CPM) over your test period. 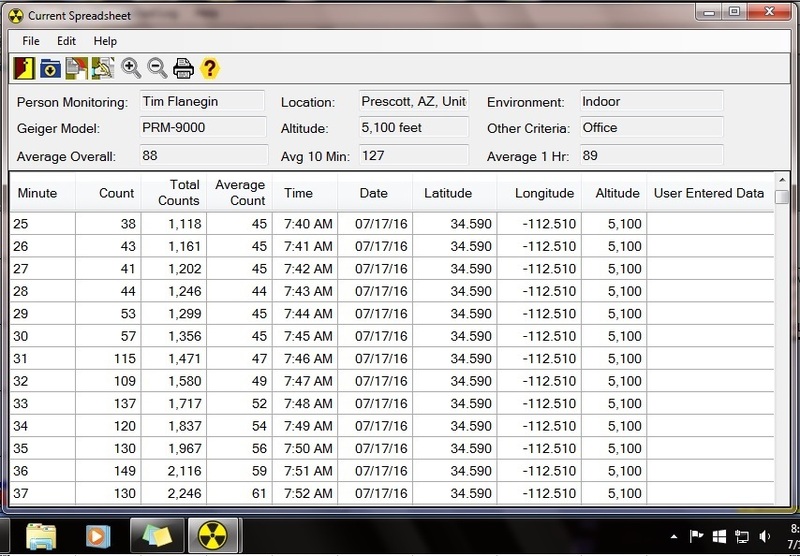 The GeigerGraph software is especially useful for monitoring environmental radiation, alerting you to any elevated levels relative to your typical background count. The software issues an audible and visual alert (play this Alert sound file) whenever the CPM exceed a user set desired level. For example, the picture above shows the program first monitoring background radiation, but then halfway through the monitoring period, issuing a visual alert because some radioactive "event" caused the radiation counts to exceed the user set Alert Level. As a full Windows program, GeigerGraph can optionally run in the background while you multi-task, notifying you only when your pre-determined Alert Level is exceeded by actual radiation counts. Pleasing interface, including an easy to understand running total and summary of Radiation Count data, attractive 3D graphing, a flashing LED with each radiation count, and handy speed buttons. Identify your monitoring station and associated data records, including graphs and spreadsheets, by the Person Monitoring, Location, Altitude, Geiger Counter Model, etc. The count data for each minute is recorded on an Internal Spreadsheet (see image below), and you can make notes for each of those minutes for analysis that you may be conducting. The program also saves the radiation count data every minute to a text file that can be exported to an external spreadsheet program such as Excel or Lotus 123 for further analysis. You can configure the program so that a Radiation Alert executes a computer program. GeigerGraph also incorporates a simulation designed to mimic the recording and graphing of radiation counts in the instance where you have no compatible digital Geiger counter plugged into your computer to produce "real" pulses. 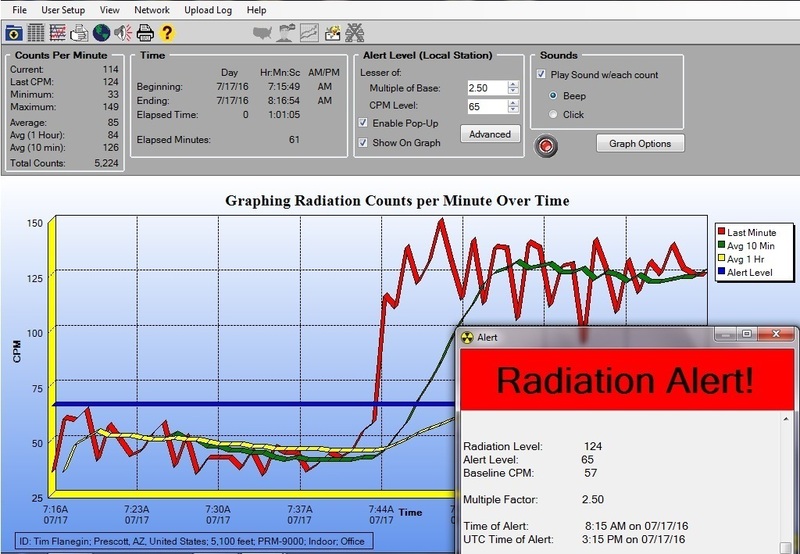 The simulation demonstrates the graphing of background radiation, followed by an alertable and elevated radiation count from a theoretical radioactive "event". The optional data cable has a 3.5mm stereo plug on one end which plugs into the Geiger Counter's dual miniature jack. Using a typical model, the output at the tip of the plug provides a positive 5 volt pulse each time the Geiger counter detects a count. The opposite end of the data cable is a standard USB-A connector. Software is issued by Download. Software is a Windows program which can run on any PC with Windows XP or later. Order the Standard Version of GeigerGraph above, or select our Radiation Network software from Related Products, which offers every feature from the Standard version, but adds in access to our wildly popular Radiation Network. Orders for ths product are typically processed within 1 business day. The software itself is distributed by Download. Instructions for registering your software will be sent by separate email when your order is processed. If you need a Data Cable, choose that also from Related Products. Note that the Inspector USB, Inspector EXP-USB, and the Digilert 200 already come with a compatible USB cable.